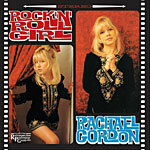 CD review: "Rock 'n' Roll Girl"
Another San Diego-based singer who is more visible on MySpace and the Internet than in the local club scene is Rachael Gordon. A cross between '60s modster, '80s new waver and '90s girl power pop singer (like a lost character from the "Austin Powers" movies), Gordon has a new "best of" CD out on a Japanese label that will undoubtedly be a surprise to many San Diego music fans who are utterly unaware of her. If far from a household name, Gordon has a great voice and spot-on timing, both of which she puts to good use in a set of radio-friendly pop tunes most of which sound like lost AM radio hits. Apparently not a songwriter herself, Gordon's song selection comprises an interesting collection of the totally unknown (two songs by San Diego's Bart Mendoza), the obscure (a cover of The Pursuit of Happiness' "Man's Best Friend," "Rock and Roll Girl" from Paul Collins' Beat) and even a genuinely familiar hit (Scandal's 1980s hit "Goodbye To You"). The cool thing is that the songs you've never heard of before sound just as good as the hit she's covering. The production is top-notch, although the liner notes make her out to be far bigger than she's been so far. Still, it's a neat collection of tunes by a talented singer the rest of us can only hope becomes more active locally.